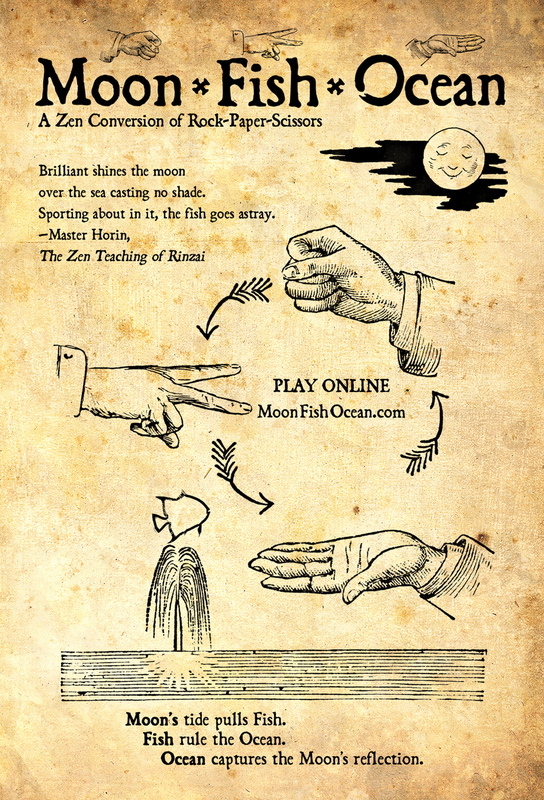 Moon Fish Ocean is our whimsical Zen version of "Rock Paper Scissors." You can play the game online at the official website. Use Moon Fish Ocean to navigate the maze of pathways in a formal garden (especially a garden with a koi pond!). You and your companion should throw a hand gesture at each crossroad or forked path. If the person on the left wins, go left. If the person on the right wins, go right. If it's a tie, continue walking straight ahead (or throw another round in the case of only two choices of direction). The game is guaranteed to lead you to all sorts of beautiful areas of the gardens you didn't know about, simply because you would never have gone down certain (less eye-enticing) paths. So Moon Fish Ocean can serve as a form of navigation in which Lady Luck dictates the itinerary. It is not clear to me what makes this conducive to meditation. Is it being so focused on the activity that all else is put aside? Like "walking meditation," Moon Fish Ocean can be a form of meditation in action, in which the experience of game play is the focus of heightened awareness.